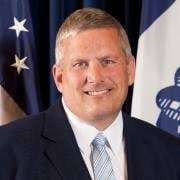 Governor Kim Reynolds is giving no hints about who she may choose as a replacement for Iowa Secretary of Agriculture Bill Northey. President Trump has nominated Northey to be an undersecretary in the U.S. Department of Agriculture, but Northey will not resign from his state post until he’s confirmed by the U.S. Senate for the federal job. Reynolds points to the experience of former Governor Branstad who was named as Trump’s pick for Ambassador to China in December, but didn’t resign as governor until late May when he was confirmed by the U.S. Senate. “I think history has shown we don’t know what the timeline is,” Reynolds says. Reynolds expects she’ll have “some time” to consider candidates to fill out the rest of Northey’s current term as secretary of agriculture, which ends in early January of 2019. A few state legislators who are farmers are among those rumored to be under consideration for the post, including State Representative Pat Grassley, the grandson of U.S. Senator Chuck Grassley. The position of state agriculture secretary is not mentioned in Iowa’s constitution and was created 45 years ago by a state law. Only four people have served as state ag secretary. Northey has had the job since 2007. Democrat Patty Judge served eight years before that. Another Democrat, Dale Cochran, was in the office for 12 years. Republican Bob Lounsberry was the first person serve as secretary of agriculture, starting in 1972. He was in the post for 24 years.